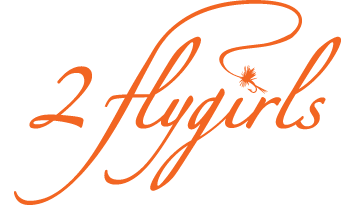 2 flygirls: Hyun, ever so ready to fish the Boulder River! 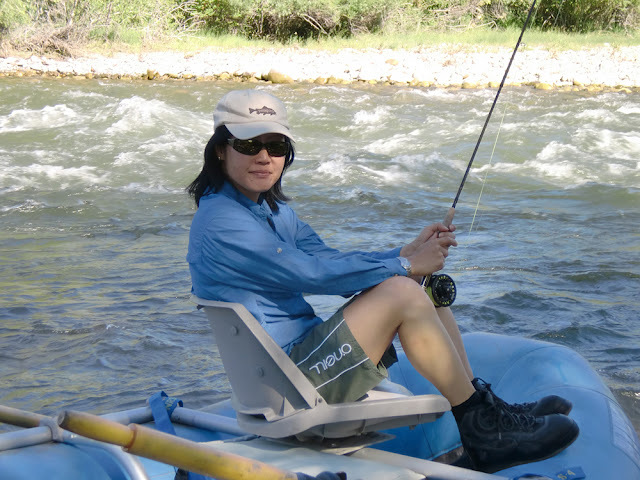 I give you fly fishing model, Hyun Kounne my friend! Doesn't Hyun look just so at peace with a raging river -mind you- in the backdrop? On this particular morning we: Eric, Hyun and I drove about an hour to the Boulder river. 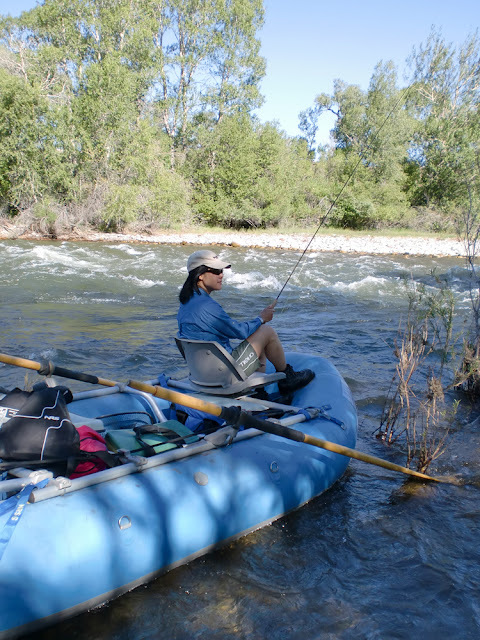 We were quite alone with the exception of a few campers and 2 other fellow anglers (women). What do ya know, there are more and more of us girlies out there! We have never fished from a raft before. To Eric's horror my boots had studs. Needless to say that I was not allowed to partake in the adventurous waters experience unless I proceeded to remove my suicidal boots subito presto! In exchange for my compliance, Eric loaned me his size 11 men's river sandals. Now, I'm a size 5 womens! See the picture?? This alone brought the whole experience to a whole different and may I say challenging level. I would not call it extreme sports but not far off : ) Every single time we accosted the shore and had to walk 20 or 50 feet, that I did not break my neck was a bloody miracle! Well, aside from looking like Bozo the clown from knees down I had the best time, really. I caught 9 fish that very day. I had never caught so many in one day before. Small and big and everything in between. As for this weekend Hyun and I are going mouse pattern fishing... That will be a first for both of us. If I remember correctly I've only fished once during the night before. Well stay tuned as it has the potential to be a very event filled night.... or not. H: I don't know how ready I was to fish the Boulder... Nymphing all day--I felt like a nymphing robot. Give me an oar and I would have rather done some whitewater rafting. However, it was fun watching Josée try and walk around in Eric's sandals :) She was a real trooper! The highlight for me was the scenery driving over there: views of the Crazy mountains, straight out of an old John Wayne western. You could imagine the rugged high ridgeline hiding scouting Indians and the green fields below overrun with herds of grazing antelope and bison. Eric told us the story of how the Crazies got its name. A family of white settlers traveling west stopped in the mountains to get some rest. One day the father ventured out and didn't return. So the mother sent her sons and daughter to look for him. She heard screaming and went to investigate. She discovered her children massacred by Indians--went crazy--grabbed an axe and killed several Indians. Hence, it's called the Crazy Woman mountains--Crazies for short. The other sight I won't soon forget was spotting a huge, beautiful, bald eagle, perched ever so nonchalantly on a pile of rocks right along the road. So where are the pictures of Josee tripping along in the boat-sized sandals? ?